(Bloomberg) -- The newest electronic market makers in currencies are growing at high speed. 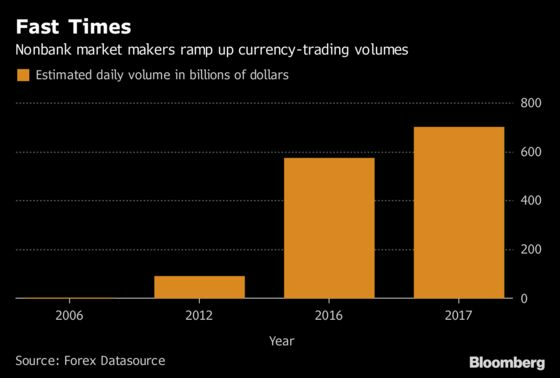 Nonbank liquidity providers increased their foreign-exchange trading volumes to an estimated $700 billion a day last year, from $575 billion in 2016, according to Forex Datasource, a research and advisory firm. Algorithmic traders are using technology, speed and experience in exploiting correlations across asset classes to muscle in on the $5.1 trillion-a-day currency market, which has long been dominated by the world’s biggest banks. XTX Markets Ltd., Citadel Securities LLC and Virtu Financial Inc. are among the firms moving to provide more currency liquidity after some banks pulled back in response to increased regulation and capital constraints. Global Trading Systems LLC, HC Technologies LLC and Jump Trading LLC are other nonbanks that are active in FX.